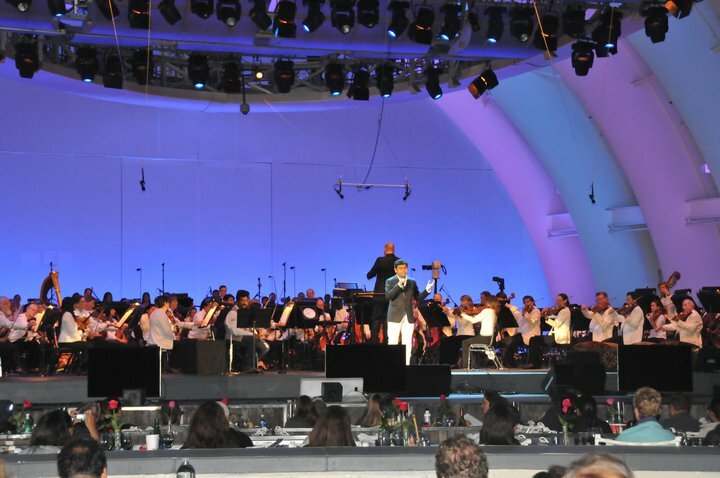 Background Score: A.R.Rahman at Hollywood Bowl - What went wrong? A.R.Rahman at Hollywood Bowl - What went wrong? Not many who watched A.R.Rahman’s concert with L.A. Philharmonic Orchestra live at Hollywood Bowl seem to have liked it. They expected a regular sing-song A.R.Rahman concert, though A.R.Rahman himself mentioned in many of his pre-concert interviews that this is not a regular concert and that the orchestra would be performing themes from his film scores. Even if not for these interviews, the moment one sees L.A. Philharmonic orchestra, one could have guessed that it is not one of those Jai Ho concerts. Your ignorance is not Rahman’s fault. Also, instrumental music is not everyone’s cup of tea. But, that is not the problem. Irrespective of the expectations of the audiences, if music performed had that magical power to infuse a sense of joy in the hearts of the people, no one would have complained. I did not watch A.R.Rahman’s concert with L.A. Philharmonic Orchestra live at Hollywood Bowl. It is not fair to pass a judgment without having the first-hand experience, but still these YouTube videos do give a strong sense of what it was like when they were performed, live. After watching all the dirty quality videos of the concert in YouTube, I feel I also would not have liked the concert if I were there. What was wrong? I can only say why I would not have liked it, even if I had gone there expecting a concert with Orchestra performing Rahman’s instrumental film scores. I do not like listening to orchestral concerts in the open-air auditorium, no matter how powerful a sound system you provide. The nuances in orchestral pieces are best experienced in a closed auditorium. And A.R.Rahman is no John Williams. Rahman’s orchestral pieces mostly are not chaotic, unpredictable, and bombastic and intricately layered enough to engage me in a live concert in an open auditorium. Rahman’s is mellifluous, haunting tunes that are just expanded on an orchestra with different sections playing supporting parts. Such pieces require the walls of a closed auditorium to give the audience an immersive experience. Compare the experience of listening to the performance of "Mausam and Escape" in Nobel Peace Prize concert with that of in Hollywood Bowl. I am glad to read that Rahman is planning for one such concert in India. I hope that when it happens, it happens in a closed auditorium. There may not be closed auditoriums in India that could pack in 20,000 people, which is the minimum number of attendees of any given Rahman concert. But, filling the hearts of a given number of people with joy and satisfaction is much better than merely filling a given auditorium space with more people most of whom would leave with a sense of disappointment. The idea of playing visuals from the films in that giant screen has gone terribly wrong. I understand the purpose, non-Indian audiences and all that. But, this is ridiculous. The screen shows frantic action sequences from Endhiran, when the orchestra is performing a calm and subdued version of “Pudhiya Manidha”. It is such a distracting contrast. It totally turns off one’s interest in the music piece. And when you have Rajini on screen doing all those stunts, I wonder if anyone would paid any attention to the orchestral music. The audience cheered in the middle of Lagaan theme because the peak in the crescendo was perfectly synced with the visual of Aamir hitting that epic winning shot. This is the amount of satisfaction that a perfectly synchronized music and visuals can give the audience, but it looks like that did not happen in any of the pieces performed except Lagaan. “Arima Arima” chant by Ragapella group was totally out of sync with the orchestra. Also, the number of singers singing “Arima Arima” is less. It totally lacked the grandeur and was not effective. In an interview, Rahman told that he recorded Arima choir parts with 20 voices and overdubbed it multiple times to make it sound like a grand choir. At least 50 singers should have been there on the stage singing that part for that piece to be effective enough. I am not sure if the suites compiled from the films’ cues were tight enough. There were too many middling loose moments in the middle of the piece. The transition from one cue to another in a suite is particularly crucial. It should be neither abrupt nor take too long. Seamless is the word. In Robot Suite, the middle section lingered far too long on ‘Pudhiya Manidha’ melody. There are so many other bombastic pieces in Robot. The whole suite includes only film’s End Credits music and few variations of Arima song. Mangal Pandey Suite also had the same problem. For “Warriors of Heaven and Earth” Suite, of all pieces from the film, they have chosen ‘Desert Storm’. I love that piece. However, considering that the performance is for a live audience, most of whom may not have heard the piece before, I doubt if it is a right choice. Instead, ‘Mountains’ would have worked better. It has a serene melody and is richly orchestrated with wood winds and strings. Not to mention, the most bombastic of all pieces, ‘Warriors of Heaven and Earth’, a suite of this film’s score without this piece, for me, is unthinkable. I do not know if they were played in the concert. None of the videos in YouTube has a full version of the performance of this piece. Most of the pieces were performed in a tempo lesser than that of the original (especially the End Credits cue from Mangal Pandey in Mangal Pandey Suite) and this I guess is one of the main reasons why the pieces sounded long and tiring. I liked the orchestral version of Lathika’s theme and Mausam and Escape from Slumdog Millionaire, though they were stretched tad too long. Did Naveen play the Lathika’s theme as a solo on Indian flute? I could not hear it properly in the YouTube videos. Lathika’s theme sounds its best on an Indian flute. Naveen, as always, was brilliant in Bombay theme. However, I never liked western orchestra playing Bombay theme. The way the strings orphan the notes in the very first bar is something an ear trained to listening to the original cannot stand. I do not know how to play a Violin. Is it so difficult to bow and pluck the notes in that phrase with the required fluidity on Violin? I am not much in favor of putting a symphony orchestra behind Rahman’s songs. I could not recognize that the orchestra is playing “Tamizha Tamizha” melody, until the brass section took it over for the final crescendo of the song. “Cry of a Rose” is a Naveen show, symphony orchestra does not add much to the experience. However, “Naan Varuvaenae” is one of those few Rahman songs to which we could put a symphony behind. I would love to listen to it in better quality. But, in this concert, Rahman’s singing of “Naan Varuvaenae” was quite tentative and lacked the soul of the original. The only piece I have no complaints about in the concert is ‘Intervention’ from Couples Retreat. The strings section is this piece is purely divine, and Rahman’s alaaps were perfectly in sync with the orchestra. I do not know what other pieces were included in Couples Retreat Suite. Jason and Cynthia theme suite is a must, I guess. I would be happy if someone uploaded full version of Couples Retreat Suite. Also, I am eager to know what was performed in 127 Hours suite. If "Liberation theme" were included in the suite, wonder how they had managed to perform it without Guitars. As a Rahmaniac, I am dying to watch such a symphonic concert in India, but hope the execution is far better than it was in Hollywood bowl. “Anything that goes out of my studio has to be good”, said A.R.Rahman. I hope he extends that policy to his live concerts too. Such a nice article...Congrats...Inspires me to revive my blog again..So far from the views presented in various forums and websites, ARR and LA Philharmonics didn't click. It had so much grandeur but the impact was missing. Though it is the orchestra performing ARR's themes, I also feel ARR was a very active partner in all the arrangements. Our fellow hubbers in TFMPAGE can discuss this and can also add to the list of compositions that he can translate into full fledged WCM scores..I have not added his Bombay Theme, as it is a regular in almost all his concerts. Karl Marx - I have been thinking along these lines. I am planning to post with Audio Clips of Compilation Suites of Film Scores that I would want to listen to in such a symphonic concert. Personally, I don't want songs to be played in such concerts. Rather a Suite can be compiled from preludes and interludes of his songs that are orchestral. Yes Suresh! !You are right...But i sincerely hope ARR sees our opinions too...Naalai Ulagam has a wonderful brass section...Ratchagan Theme has the class...Oruvan oruvan and Eduda Andha Suriya melam has that jinoistic appeal...Hope he realises this..